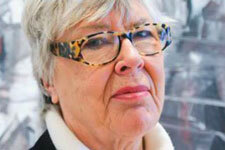 One of Norway’s leading artists, Inger Sitter, died last week after a career that spanned seven decades. She’ll be remembered not only for her own work since debuting as a child prodigy at 13, but for championing the rights of other artists to work. Sitter worked hard on behalf of artists, lobbying Labour Party politicians in power to guarantee a minimum wage for artists. 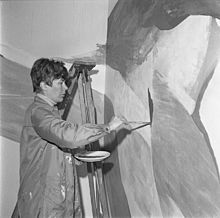 She was genuinely concerned with securing income for artists, reported newspaper Aftenposten, while also excelling as an abstract painter herself who was among Norway’s most internationally oriented. Sitter was born in Trondheim but moved frequently with her Finnish mother and Norwegian father, who sailed for a Norwegian shipping company. She grew up in Antwerp and later studied there. Her career began as a figurative painter but she quickly became one of the great modernists in Norway’s post-war art world. Sitter completed many major projects including art integrated into the government buildings in downtown Oslo, the business school Norges Handeslhøyskole in Bergen and Nordlys Hallen in Hamar in connection with the Winter Olympics in 1994. She was also a professor at the state art academy, Statens Kunstakademi and she held her last exhibit as late as last year, in Oslo. Sitter was diagnosed with cancer in 2011 and died on Tjøme. She was 85.